My friend Katie brought the most amazing thing to work one morning. It smelled like warm carrot cake but it looked like a healthy bowl of oatmeal. Plus, she told me it’s mostly vegetables, it’s vegan, and she made it overnight in her crock pot. Guys. Someone needs to tell me about these things sooner. I’m counting on you. She pointed me here for the recipe, which is one blogger’s test kitchen post of a recipe from The Vegan Slow Cooker, which is now on my wish list of books because it looks like a work of pure genius. You’re going to want to stir it – go ahead! I’ve done it both ways and it doesn’t seem to matter. I find that mine burns just a little around one area of my crock pot no matter what, so I lose about 5% of the recipe. But all crock pots are different. I made this at my parents’ house and found that it needed more time to get the same result – closer to 9 hours. Like I said, it’s a very forgiving recipe so you’ll still enjoy the outcome as you learn what works best for you. 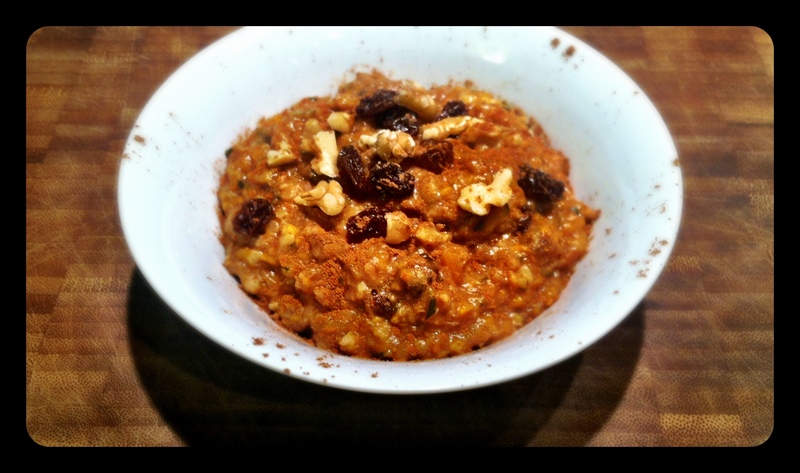 *Oat Note: This ratio of ingredients works perfectly for me with the steel cut oats you get in a bulk bin. When I bought a big bag of Bob’s Red Mill Quick Cooking Steel Cut Oats, I found that I had to add a quarter to a third of a cup more oats to get the same consistency. Bob’s also carries gluten free steel cut oats. I want to try this! I have to pick up some more veggies before making this, but it sounds good! I love the smell and taste of carrot cake, but not how I feel after eating it made the regular way with sugar. OK Cuisinart is the way to go with the vegetables. I tried this yesterday (making it) It did not smell like carrot cake while cooking, tasted it, but too early, so my slow cooker needed 8 hrs to complete. I tasted it hot, did not like it. Then I remembered that some things I cook taste better the next day after cooling in the fridge. So, I packed it up and put in the refrigerator. This morning, took out the Oatmeal mix I cooked yesterday and I was SURPRISED at how GOOD it was! I brought some over to my neighbor and the copied recipe. She LOVED it and is going to share the recipe with her daughters! Oh! I’d love to hear more about the oatmeal bars. Do you have the recipe somewhere handy to share? after a couple of days, my spices didn’t hold up to be something special. So, I tried Garam Masala! WOW, has a bit of black pepper in it, but can take this dish a whole different direction! I have some organic cocoa in my baking cupboard, I keep forgetting it is there! I will take some out tomorrow and thaw some of that carrot cake oatmeal. I froze it to see how it tastes when thawed. I am the only one who eats it in the house so I have to freeze some portions. I love Penzeys, I can’t even conceive buying spices in the supermarket anymore! I love my basil, and herbs we grow in my herb bed… what a difference! We picked an Avocado yesterday and enjoyed it right away! Our tree is small, but we look forward to getting more, so I am gathering all the Avocado recipes in advance! And our bananas are getting ripe, soon there will be a lot to make something with! Isn’t it FUN to have food around to experiment with? Looking forward to seeing what you come up with! forgot to mention that my icon is a photo I took of our banana tree bud from our Virginia garden!